WOLFSBURG, Germany, September 9, 2016 (ENS) – Volkswagen and the Chinese corporation Anhui Jianghuai Automobile will explore joint development of electric vehicles in China, the two companies agreed in a Memorandum of Understanding (MoU) signed at VW headquarters in Wolfsburg on Tuesday. Known as JAC Motors, Anhui Jianghuai Automobile is a Chinese state-owned automobile and commercial vehicle manufacturer based in Hefei, Anhui Province. The two companies are studying the feasibility of a joint venture and aiming to sign a formal agreement within five months, JAC Motors said in a stock exchange filing. 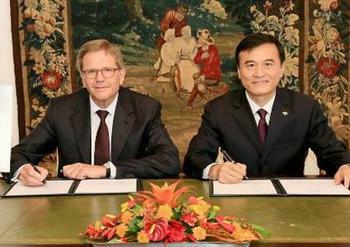 The MoU covers a long-term partnership for joint development of innovative battery-powered electric vehicles in China. It indicates that talks on the establishment of a new joint venture company to fund the project have already begun. Automakers based in countries other than China are only permitted to manufacture cars in China through joint ventures with Chinese partners. The new joint venture company would focus on “new energy vehicles,” China’s term for electrified vehicles. Cooperation will cover research and development, manufacture, sales and mobility services for new energy vehicles and their parts. The top priority would be to develop zero-emission mobility solutions, which are “crucial for the sustainable development of China’s environment and society,” the document states. “As we aim to be at the forefront of e-mobility, Volkswagen Group is looking forward to explore all options to set up a close and mutually beneficial partnership with JAC,” said Matthias Müller, who chairs the Board of Management of Volkswagen AG. “We believe this cooperation would not only benefit our two organizations, but would also be of great value to our customers, a sound environment and the Chinese society in general,” Müller said. VW will be launching a broad-based initiative for electro-mobility and intends to develop more than 30 new, purely battery-powered electric vehicles over the next 10 years. JAC Motors has two vehicle brands, Jianghuai and Ankai. JAC delivered 333,639 vehicles and chassis in the first six months of 2016, an increase of 14.15 over the same time period last year. New energy vehicle sales increased by 261 percent compared with last year, while SUV sales maintained stable growth at plus 30 percent. “Together, Volkswagen Group and JAC will thoroughly explore all options how to concentrate our resources, including existing and future model platforms, technologies and other expertise, to achieve a competitive product strategy as soon as possible,” said Prof. Dr. Jochem Heizmann, a member of the Board of Management of Volkswagen Aktiengesellschaft as well as president and CEO of Volkswagen Group China.